No more indiscriminate fishing. With the support of market power and consumer demand to promote sustainably-caught tuna, we can help Lagonoy Gulf become a top yellow fin tuna provider. Late afternoon along the coast of Tiwi in Albay, wives were mending nets and trading fish tales while waiting for the fishermen to return. 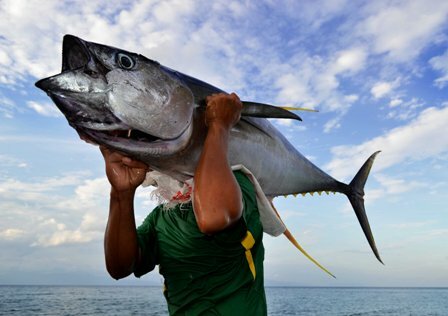 This time of year, highly-prized bankulis or yellowfin tuna pass through Albay by the thousands. The first of the outrigger bancas arrive, unloading a decent haul of pundahan or skipjack – small, striped tuna which have proven surprisingly resilient to commercial fishing. Bancas two and three return empty-handed while a fourth disgorges a tub of galunggong or scad. Few yellowfin tuna are landed. To stop overfishing and help manage existing tuna stocks in Bicol, the World Wide Fund for Nature (WWF), Bureau of Fisheries and Aquatic Resources (BFAR), plus the Philippine Council for Agriculture and Fisheries (PCAF) convened the first meeting of the Gulf of Lagonoy Tuna Fishers Federation (GLTFF), comprised of the coastal municipalities ringing the Lagonoy Gulf – 3070-square kilometres of sea separating the Bicol mainland from the storm-swept island of Catanduanes. Over 500 people attended Bicol’s first large-scale gathering of fishers, held at the Lagman Auditorium of Bicol University’s Tabaco Campus last June. 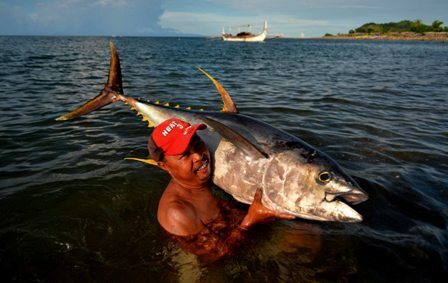 Since 2011, WWF has been working to enhance yellowfin tuna management practices for 5000 fishers in 112 tuna fishing villages around the Lagonoy Gulf and the coast of Occidental Mindoro. 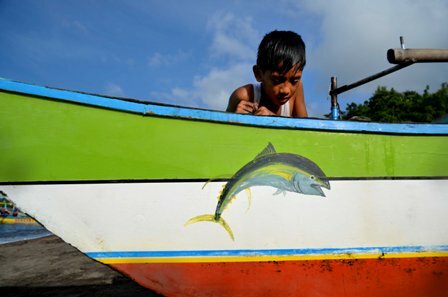 WWF’s Public Private Partnership Programme Towards Sustainable Tuna (PPTST) has since organized tuna fishing associations in all 15 municipalities in the Lagonoy Gulf, plus six LGUs in the Mindoro Strait. It spearheaded the registration and licensing of tuna fishers, vessels and gear to minimize bycatch and illegal fishing, deployed 1000 plastic tuna tags to make the fishery traceable, and completed a series of training sessions on proper tuna handling to ensure that exported tuna continually meet international quality standards. PPTST harnesses market power and consumer demand to promote sustainably-caught tuna and support low-impact fishing methods like artisanal fishing with hand-line reels – better alternatives to commercial tuna long-lines, which stretch up to 80 kilometres and are rigged with up to 3000 baited hooks. Funded by Coop, Bell Seafood, Seafresh and the German Investment and Development Corporation, PPTST involves European seafood companies plus their local suppliers, BFAR, local government units in the Bicol Region and Mindoro, the WWF Coral Triangle Programme, WWF-Germany plus WWF-Philippines. Today about 52% of the country’s fish exports come from tuna, which buoys the lives and livelihoods of millions of Filipinos. WWF’s Global Oceans Campaign, Sustain Our Seas, builds on decades of work to rekindle the health and productivity of the Earth’s oceans.